MARCH 15, 2019 — The week of March 11, NOAA OR&R staff conducted oil spill science and response training in Hagatna, Guam for over 40 spill responders and planners. OR&R's Charlie Henry (center) leading a field exercise. Image credit: NOAA. The training included lectures, case studies, and field exercises on oil spill science, as well as assessment and cleanup of oiled shorelines. Local NOAA Fisheries experts presented information on Guam and Commonwealth of Northern Mariana Islands (CNMI) natural resources at risk from spill impacts, including several case studies from local vessel groundings. Spill response planning and training is particularly important in Guam and CNMI because of the remoteness of the islands from the U.S. mainland and their numerous sensitive marine habitats, such as corals and important fisheries. 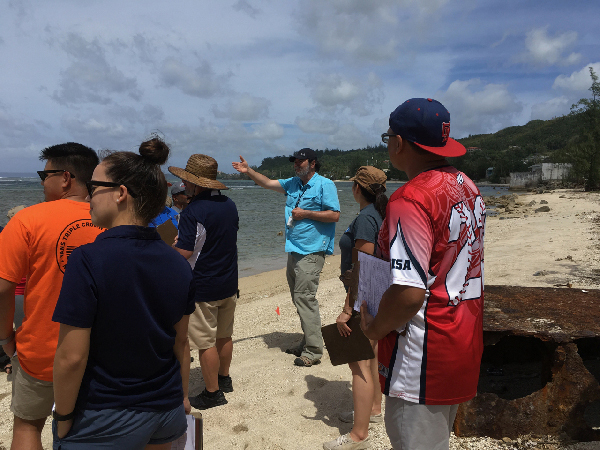 Class attendees included responders from U.S. Coast Guard Sector Guam, U.S. Navy, Guam Environmental Protection Agency, U.S. National Park Service, and the oil response industry. For more information, contact Ruth.Yender@noaa.gov or Kim.Albins@noaa.gov.